The Farmer Fred® Rant: Avocado Trees in Sacramento? Good Luck. 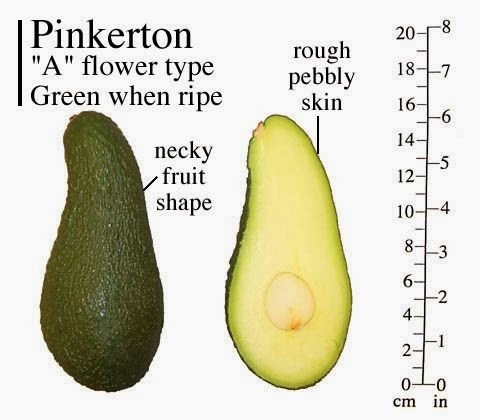 Can you grow avocados in the Sacramento area? Maybe. Probably not. It depends. Good luck. People loooovvvve avocados. And that love overrides the commons sense of intrepid area gardeners. Admit it: you've enjoyed that Hass avocado from the grocery store; saved the pit; suspended it on toothpicks over a glass of water; then, planted it outside when that pit sprouted roots. • Choosing the wrong variety. The Hass avocado tree, for example, becomes avo-mush after a season of our typically freezing December-January mornings. • Wrong location. Avocado trees need nearby reflective heat surfaces for best survivability: south or west facing walls, nearby concrete or brick patios, shelter from our hot, dry winds. Although they will grow in the shade, they need full sun to fruit. • Wrong soil...aka, heavy, wet, clay soil. Yet, despite these natural hurdles, the most asked question in the last two years has been: "Can I grow avocados here?" But for those still attempting this Sisyphusian task, I offer some guidance. "Hi Fred, I had a chance to hear your show for the first time on Sunday while driving. I had no idea that a show like this was going on in Sacramento. I wanted to ask you a question because none of my friends seem to know. 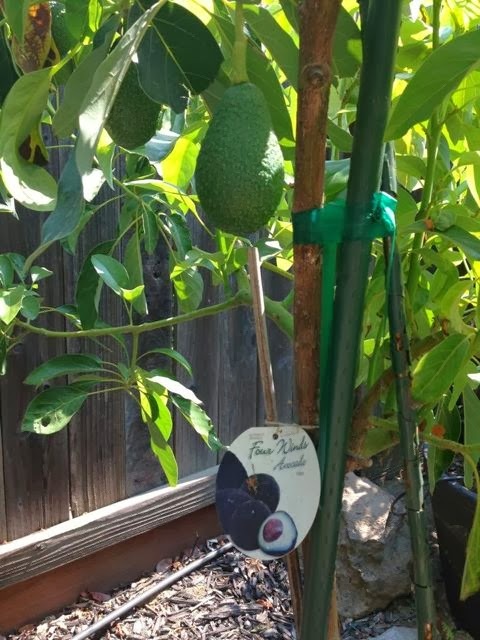 I live in Elk Grove and have an avocado tree that I planted early this spring. Its grown about a good 8-12 inches in the past few months and has been doing well. In October, I started noticing the leaves begin to brown. The tree sees about 4 hours of sunlight a day due to the location of the tree and surrounding shade trees and home. Any suggestions on what this browning and how to take care of it would be great!" Watering may be the culprit. Avocados need moisture, but they need excellent drainage. 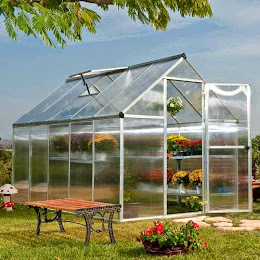 If the soil is too moist for too long, that can cause leaf drop due to any number of soil borne diseases such as verticillium wilt or root rot (phytophthora). 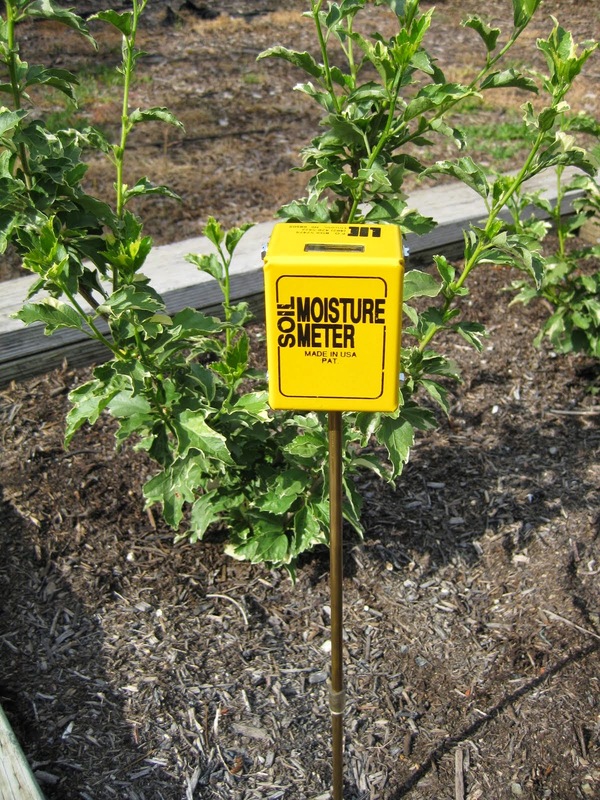 Check the moisture level around the root zone at the outer edges of the tree, about 10 inches down, before you water. A moisture meter can aid you in this. Planting on mounds can alleviate the problem of poor drainage, as well. Good water management is essential to reduce the threat of rot. 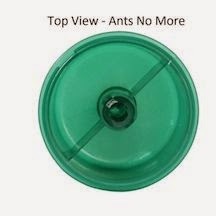 It prolongs the life of diseased trees and can prevent spread to other trees. 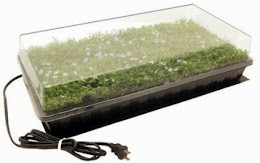 Moreover, the only way to know how much water is correct for your soil is using that moisture meter or digging down to the root zone and grabbing a handful of the soil. If that handful is muddy, don’t add more water yet. If that soil is bone dry, then definitely increase your watering frequency. The ideal moisture level for that handful of soil: you should be able to form a clod easily with your hand, yet break it apart easily. There should not be water running down your arm. 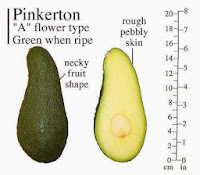 For those interested in trying to grow avocados here, choose varieties that have a chance to survive our cold winters. 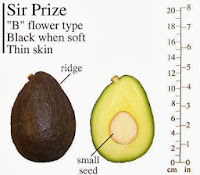 Among the avocado varieties that may succeed here are the Bacon, Zutano, Mexicola, Fuerte, Pinkerton, Jim, Sir Prize and Stewart. These have better cold tolerance; however, success here with avocados is iffy. Placing the tree where it can get reflected heat in the winter from a south-facing wall may help. What about the Hass Avocado? Yep, a Hass avocado tree, albeit a small one. ALL GARDENING IS LOCAL (Farmer Fred Rule #1). Get back to me, Gayle, when that tree gets bigger than the house. Kids, please don't try this at home. 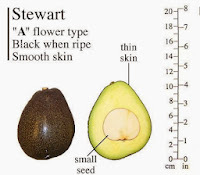 Another tip to get avocados to bear fruit: plant two different varieties. 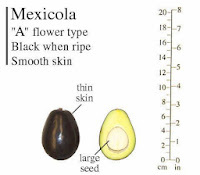 Avocado pollination is increased when you have two types of avocado trees, one with an "A" flower and one with a "B" flower. These flower types open at different times of the day. 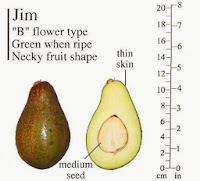 According to the California Rare Fruit Growers Association, avocado flowers are either receptive to pollen in the morning and shed pollen the following afternoon (Type A), or are receptive to pollen in the afternoon, and shed pollen the following morning (Type B). The latest edition of the Sunset Western Garden Book lists the “Type A” flower varieties to include the Mexicola and Pinkerton. 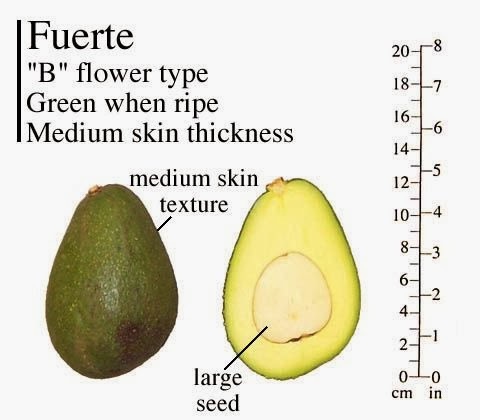 The Bacon, Jim, Zutano, Fuerte, SirPrize, and Stewart are Type B flowers. Stewart, actually, may be both Type A and B, depending on where it is grown. 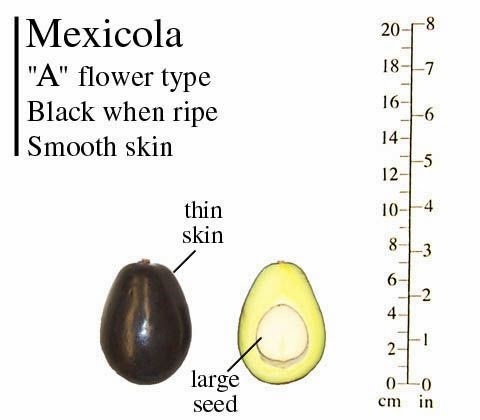 These Mexican avocados mature 6-8 months after flowering. The California Rare Fruit Growers advise avocado tree owners to use a balanced fertilizer, four times yearly. Older trees benefit from feeding with a nitrogen fertilizer, applied in late winter and early summer. Yellowed leaves (chlorosis) may indicate iron deficiency. A chelated foliar spray of trace elements containing iron can usually correct this. Mature trees often also show a zinc deficiency. The avocado flower has both functional male and female organs. The male floral organ, which produces pollen, is comprised of the anthers and stamens. The female floral organ is comprised of the stigma (which receives the pollen), style and the ovary. The avocado exhibits a type of flowering behavior known as "synchronous dichogamy". 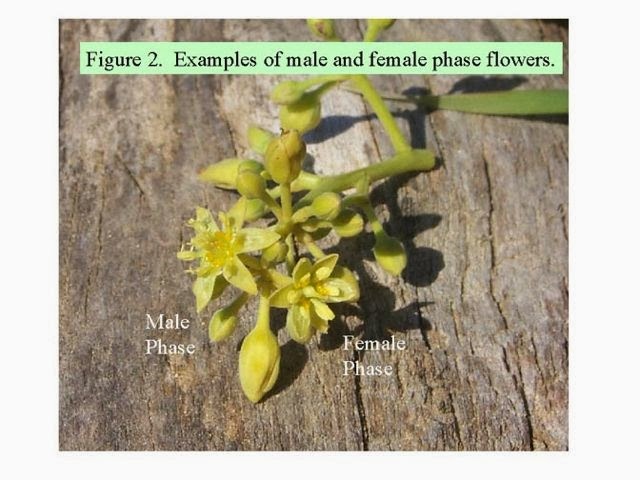 An individual flower will be open for 2 days, however the timing of the male and female phases are distinct. When the flower first opens it is in the female phase and the stigma is receptive to pollen. At the end of the female phase, which lasts 2 to 4 hours, the flower will close. On the second day the same flower re-opens in the male phase and sheds its pollen. Mexican varieties have an anise or fennel-like smell to the leaves. This is a very typical Mexican variety. Originated about 1910 as a seedling at Coolidge Rare Plant Gardens, Pasadena, CA, Fruit season, Aug.-Oct.; color, black; weight, 3-5 ozs. ; shape, spherical to pyriform; skin, thin, smooth; flavor, excellent. One of the first varieties to be commercial, planted by Mr. Henry Huntington around 1915-17. It has an anise flavor & is quite good tasting. Bears early & regularly; very heat & cold resistant (down to 20 degrees...maybe). 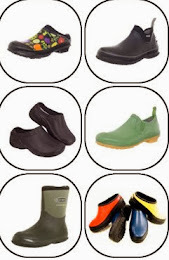 Commercial variety. Harvest begins in January in some commercial areas. High oil content. Medium slightly spreading tree. Hardy to 30 degrees. Originated in Buena Park, California, by James Bacon. Introduced in 1951. Flesh has an unusually pale yellow/green color. Oil content high. Matures Nov. to Jan. in Orange County and Dec. to Mar. in Ventura County, Ca. Consistant,heavy producer; frost tolerance excellent. Bacon has a commercial background. Large trees. Was commercial at one time. Color when immature is a very light avocado green. Some fruit has a rosy blush that does not appear to be caused by thrips. Originated in Fallbrook, California, by W.L. Ruitt. Introduced in 1941 from a selection made in 1926. Ripens in Oct. to Dec. in San Gabriel Valley, Ca. 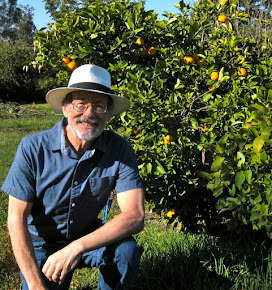 ; and Jan. to Feb. in Ventura County, Ca. Tree; consistent producer; hardy to 24 degrees; more hardy than Fuerte. Commercial variety. Fruit are oval/pear in shape with waxy bumps on the skin. Introduced as budwood in 1911 from Atlixco, Puebla, Mexico. A hybrid Mexican variety that is ready to pick in November and is good through March. Hangs on the tree well. A long time California commercial variety valued for its winter season and its B blossom type. Skin thickness is medium thin. Seed size is medium large. Season of maturity averages 6-8 weeks earlier than Hass. Mexican-race type avocados are typically more cold resistant than 'Hass' so this tree is being tried in inland valleys and other regions unsuitable for Hass. Early results do not indicate it is any more cold tolerant than Hass. Fruit shape is pear with distinctive ridge along one side. Skin texture is not truly pebbled like 'Hass' but does have tiny islands of varying yellowish shades giving the illusion of 'Hass'-like pebbles. 'Sir Prize' is upright in tree form. Peak bloom period is earlier than 'Hass' by several weeks. Originated in Mentone, San Bernardino County, Ca, on the Stewart Ranch. 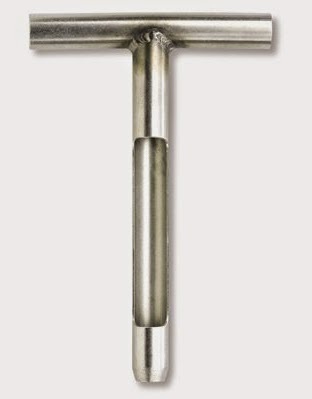 Introduced in 1956. Flesh clear, bright, light yellow shading to green toward skin, firm, but melting, excellent quality; ripens from early Oct. to mid-Dec. Tree: spreading, strong, vigorous; bears good crops. Although listed as an "A" type flower, it typically shows "B" flowering characteristics at South Coast Field Station in Irvine, Ca. 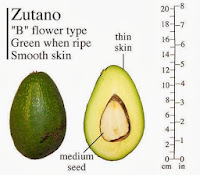 If you want to experiment, are willing to be patient, and have a wind-sheltered area with many surfaces of reflective heat, try the Mexicola and the Zutano varieties of avocado trees here in the Central Valley. And good luck. except for the pictures of Nelson's suffering avocado tree in Elk Grove and Gayle's magic Hass avocado tree in Dixon. Fred, there is a large Mexican Avacado in Curtis Park that bears every year, tree must be 30 years old or more. Last winter caused some yellowing but it is still bearing fruit. Because of the thin skin can be eaten skin and all. 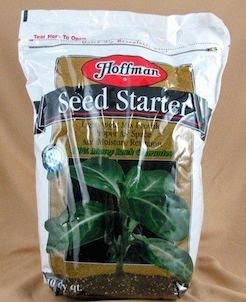 The Benefit Plant Sales will have some seedling available in the Spring. Approximately 20 years ago, I planted a pit that is now a full-grown avocado tree that produces tasty avocados every year. I don't know what kind it is though. I live in South Land Park within walking distance to the river. When the tree was 10 years old, a severe frost "pruned" the top third of the tree. Then the following year, the tree started producing avocados. My avocados are about 70 years old and huge. The tops of the trees appear to be dying. We are in a severe drought here in So. Cal. I have been leaving water on at low speed for 24 hours. Too much, not enough? Any ideas? I have about 15-16 fruits on a Zutano I planted in early 2014. The tree is about 10' tall and 8' diameter. Fruits look great. I'll let you know the quality when I pick them later this year. We live in Tracy and have 2 avocado trees, a Mexicali grande (about 15 years old) and a Stewart. The grande has produced fruit for the last 10 years, beautiful smooth skin and taste like butter. We will probably have over 200 to harvest this fall. The Stewart is only 4 years old and just producing for the first time this year. Our big problem is birds (we think). They peck at the top of the avocados (where they attach to the tree) to check for ripeness then the entire fruit is ruined. 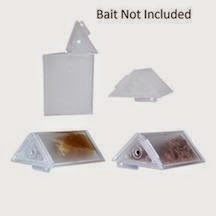 We are quite sure it isn't rats (numerous traps with peanut butter with NO takers). Could the culprits be squirrels? My dad has a Zutano avocado tree in Pomona (SoCal). Squirrels have become a numerous pest over the last few years and they chew the very top of the avocado, ruining the fruit. He made a light fabric sling filled with squirrel repellant and wraps the tree trunk. This works pretty well but has to be replaced periodically. No avocado trees in my yard, sorry. No luck here. 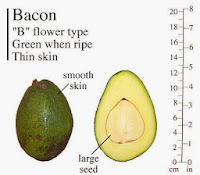 We have a 9 year old Bacon tree that produced around 250 avos this year. We live in Vintage Park. Calvine and Elk Grove - Florin Rd area. I live near you. Any tips on successfully growing the Bacon? mexicola in folsom planted 6 years ago. (2010). doing great! i love the fruit. I live in the Foothills, specifically, Grass Valley. Historically, not a place you could grow avocado trees. But, everyone I talk to agrees that the weather has changed. We haven't had snow that actually sticks for 4 years. Temps that went below 32 degrees in the past year, maybe twice. I have two dwarf avo trees that have stayed alive for the past 3 years. Their growth has been very slow, but, then, again, I've been out of town a lot so they didn't get a lot of attention. Now that I don't have to go out of town for long periods of time, I'm going to plant a fuerte and coddle it! I live in Brentwood in East Contra Costa County near the Delta and I am growing Fuerte, Mexicola, Bacon, Reed, Pinkerton, and Lamb Haas. I have done years of research and have visited trees from Napa to Oakland to Lodi to Santa Cruz. From what I hear Sir Prize and Stuart are not heavy producers in Nor Cal although they will survive but not thrive so I hear from people who have them. For good odds Mexicola, Zutano, Bacon and Fuerte; of these Fuerte and Mexicola are the most flavorful but Bacon and Zutano's buttery is excellent for those who want variety of these Bacon is slightly tastier and often the favorite for a lot of people (both are excellent sandwich avos). I'm in Brentwood, too. I had a Bacon that died off at the end of this summer (possibly drought stress) and it was only 4 years old. I'm looking to put in a Stuart and then graft on some Bacon scions when the tree puts out some branches in a few years time. How much do you water your trees, and do you ever have any winter die-back? Zutano's buttery "flavor" (that is). I planted an avocado from seed about 7 years ago and this year it is full of blooms. What's the chance of avocados this year? Well, happy to hear all the success stories. I know of two trees near Winters that are producing, but I forget the varieties. Two years ago I planted a seedling that had survived five winters in a pot, but died in a frost last winter, unprotected. A Zutano planted near it at the same time showed some damage, but survived and is growing well on a raised mound. I am going to also plant a Mexicola, and maybe a Bacon and Fuerte just for fun. Grew up in Long Beach with avocado trees all around the neighborhood, such a treat. I hope I don't have to wait too long for my first taste of my own. Hi there, what flower type is Duke and Gwenn avocados? I grew a Duke avocado from seed. It's almost a foot tall now. I now have a Gwenn avocado seed to plant. 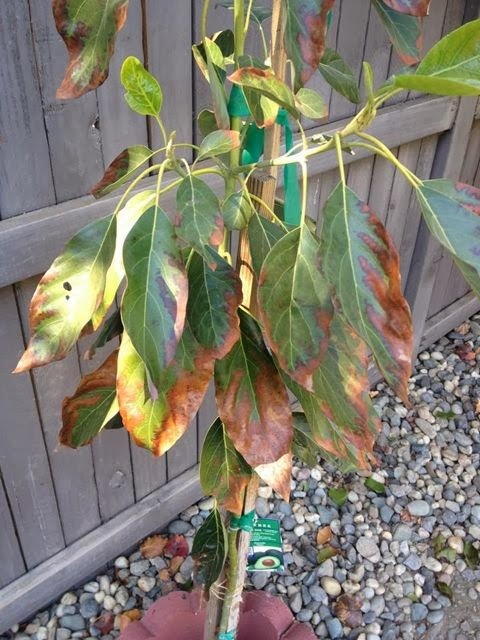 I live in Sacramento, I have 2 Hass, 15-18 feet tall, both currently have 100+ Avo's on them, starting to eat them now, been eating Avo's from these trees for 4-5 years now, my problem is my soil is not strong enough and the trees are falling over. The question I have is can you cut the main trunk off in the top 1/3 or 1/2 of the tree without killing the tree? I have a Fuerte and a Sir Prize too, these are even taller but, holding up well. The Fuerte tastes good and the Sir Prize is Ok but, not great. Does Sir Prize taste better as the tree gets older? Wow! Hass in Sacramento! That is impressive! 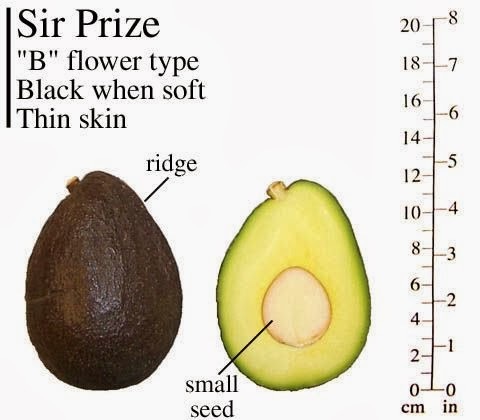 Also a Sir Prize is a surprise because they don't usually produce in the bay area. Fuerte seems to be winner all around. Live in Folsom, have a Mexicola that is 20 feet tall, has been growing for 7+ years and producing well for 3 years. No other avocado tree near me as far as i can tell. With all due respect to your knowledge, this information you've provided about growing avocados in Sacramento is rubbish. I've seen many mature avocado trees here that are 30+ years old loaded with fruit from top to bottom. I've picked avocados from these trees, some were seedling trees some were hass Bacon mexicola etc I've even seen a Reed avocado tree with full sized fruit here and the Reed is said to be less cold tolerant than the hass. I will say that these trees are a bit fussy in the beginning so you will have to baby them for the first 3-4 years but after that they're like any other tree here so do your research on them before planting and before you know it you'll have your own avocados right here in Sacramento. Avocados are tasty and delicious vegetables however they can fastly go bad if they are not kept in the right way.